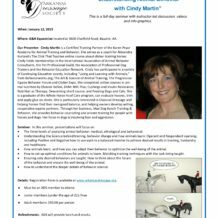 The Understanding Animal Behavior Clinic with Cindy Martin has been rescheduled for March 9, 2019 at G&H Equestrian from 9am-3pm. This event is FREE for all ADS members. Refreshments and light snacks will be provided but please bring your own lunch. Please register below or download the registration form to mail in.